If you are a regular WhatsApp user and using an Older Symbian , Blackberry or Windows Smartphone then you are probably Doomed ! WhatsApp announced that it will be ending support for BlackBerry, including BlackBerry 10, Nokia S40, Nokia Symbian S60, Android 2.1 and Android 2.2, and Windows Phone 7.1 by the end of 2016 . 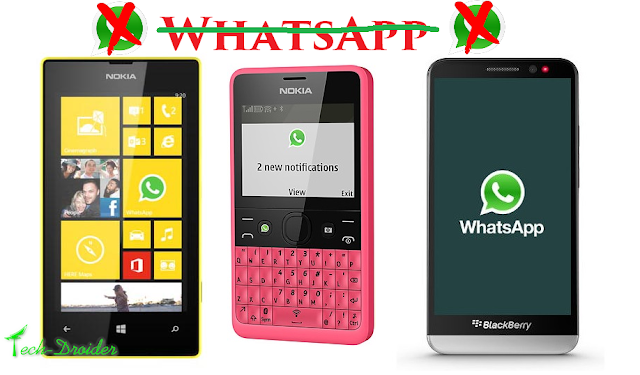 So , If you are still using an Older version of Symbian , Blackberry or Windows OS then you will not be able to use WhatsApp by the end of 2016 . Why , WhatsApp is doing all this ? The reason is simple , most of the mobile users use Android and iOS Smartphones and WhatsApp will not support the Os which is used by only a little no. of peoples .